Today is a sad day, Chrissie Wellington retires. It would have been nice to see her come out this year and win another, she went out in amazing fashion. I guess when they finish strong and never look back, she has. The woman who shocked the triathlon world with her victory as a rookie at Kona in 2007 and subsequently bestrode the world of Ironman racing like a colossus announced her retirement at age 35 from professional Ironman racing today. 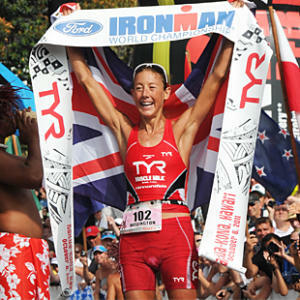 Four-time Ironman world champion Chrissie Wellington, who shattered all women’s Ironman-distance records in a late-blooming, meteoric five year career and who remained undefeated in 13 races at the 2.4-mile swim, 112-mile bike and 26.2-mile run distance, wrote in her blog that she would cease her stellar career as a long distance triathlete. “Over the past 12 months I have had time to reflect and think, about my past and, of course, also of my future.